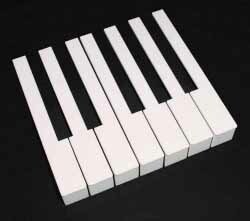 Pre-moulded keytops (.075" thick) with attached fronts (.060" thick). Heads are 7/8" x 1- 29/32". Boxed set includes 52 individual pieces. A great choice for most keyboards. Easy to work with. White or Light Cream.